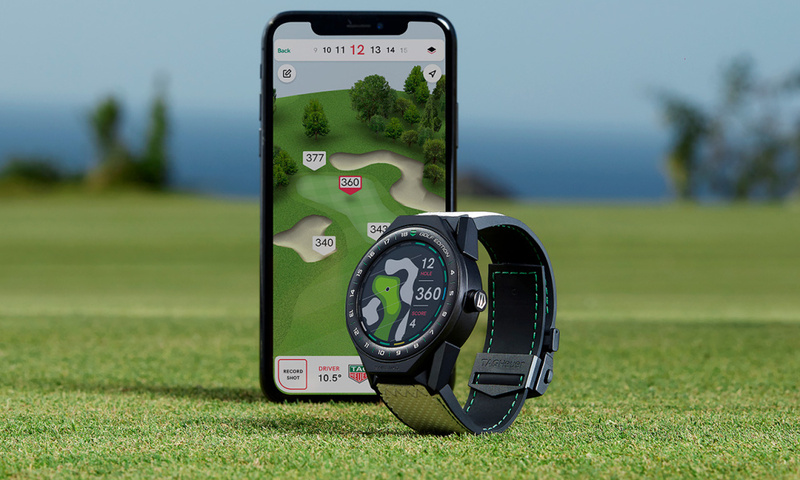 Golf watch that can actually make you better at golf!? Sports are hard. They require you to step outside and exert yourself relentlessly. The harsh sun can roast you, the blowing wind can blind you, the pouring rain may drown you. Despite all that, there are still many humans who love to get involved in sports. As if that wasn’t enough, they are always on the lookout for something to improve themselves. With so many of these people around, it’s no wonder that there are a plethora of companies that want to sell them something. One such company is Tag Heuer and they have just announced the golf watch. But… why do golfers need a special watch? Balls are included in the package. 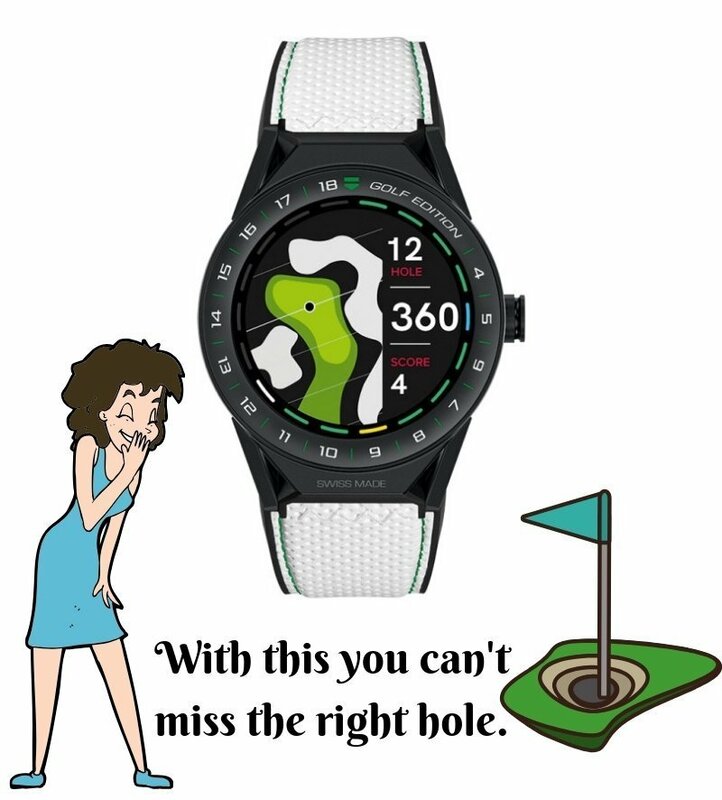 The golfers need the golf watch for numerous reasons. At least according to the folks at Tag Heuer. Those things are pinpointing your location on a 3D map of the 39,000 courses that they have info on in their database. Then, it can use that database to tell you about the landscape, hazards, the club you should use, the angle you should hit the ball at, and finally the woman you should marry based on your life choices. It can do all that while maintaining an accuracy of up to 1 meter. According to Tag Heuer, their golf watch is much superior in comparison to other similar solutions that exist. 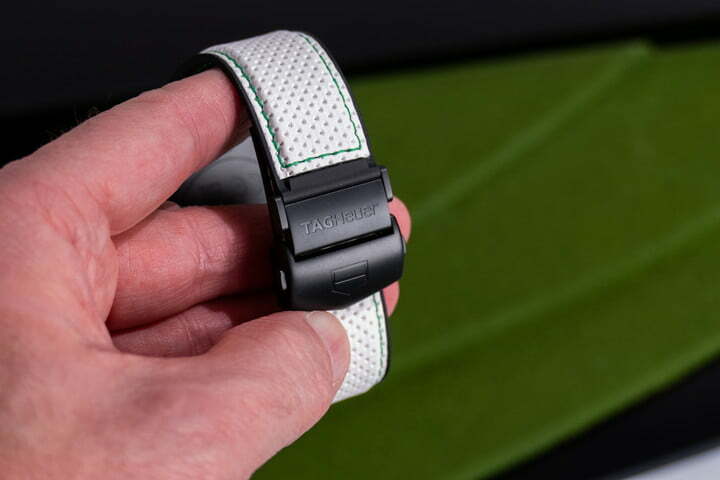 You can also use the golf watch to track the score of three of your friends alongside you. Assuming that you have friends who are as enthusiastic about this sport as you are. You will also get your shot distance delivered to you by the golf watch so you can start to appreciate that length matters. The Green stitching is nice. 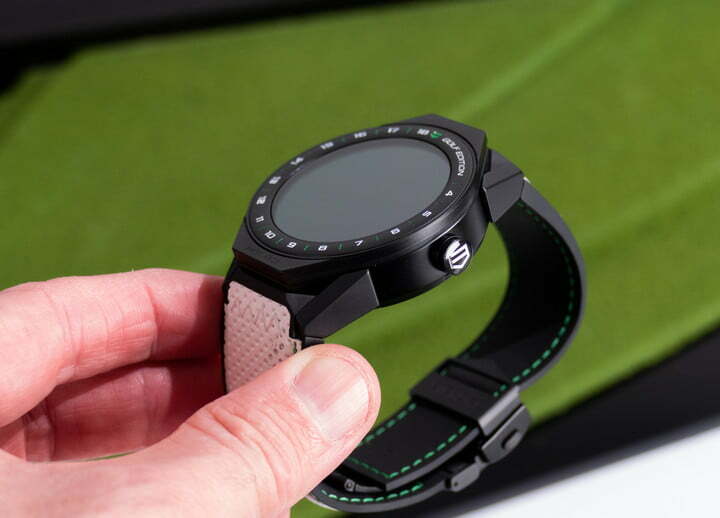 A companion android app will also be available for the golf watch. The app can be used to augment the watch’s capabilities. 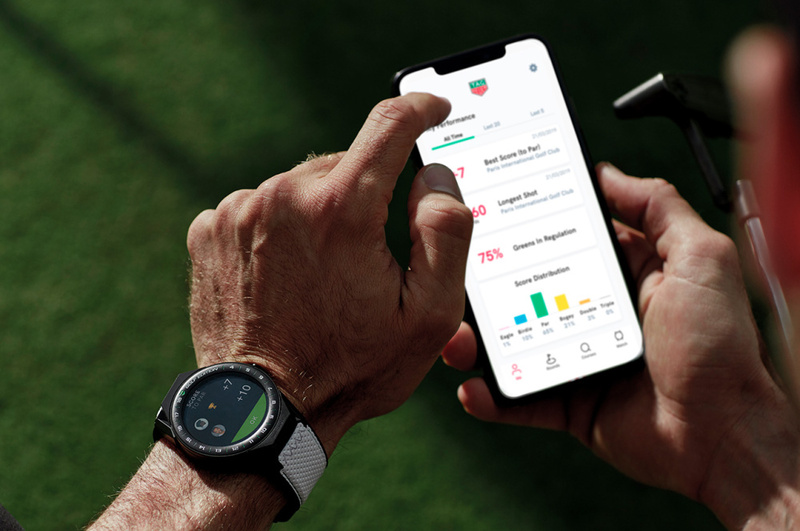 Tag Heuer says that the app can be used with other smart watches as well but for best results you should use their golf watch. I agree. One simply shouldn’t pair an Apple Watch with anything other than what apple coded to get good results. No wait. Gods have answered our calls. You can use it with the iPhone and Apple watch as well but you will need to get an annual subscription for that. I guess the Apple version of this app is revolutionary like the devices it will run on. Can you wear the golf watch in public? Yes you can. It looks good in my opinion. The golf watch is based on the Connected Modular 45. It’s called that because the size of the body is 45 mm. Duh. But unlike the heavy and teel body of the Connected Modular 45 this one has a titanium body. Oooh titanium. So fancy! Hold your sarcasm there my friend. The titanium is actually doing real work here. Due to the titanium, the watch is much lighter than before (64 grams). Ya know, since titanium is stronger so they use less material overall. 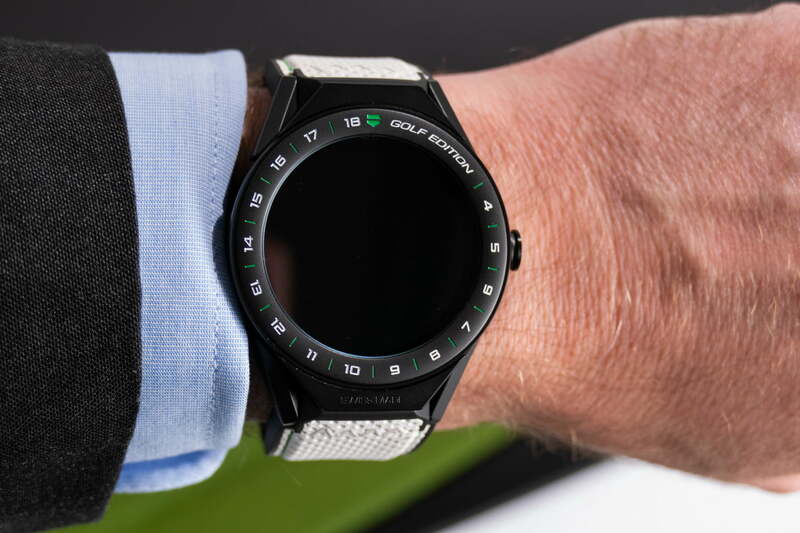 Plus, the titanium body of the golf watch is covered in a black PVD finish. This makes it more appealing to our mortal eyeballs. Looks decent on one’s wrist. The bezel of the watch has 18 numbers that parallels the amount of holes on a course. The bezel is made from ceramic therefore, the white lacquered numbers won’t leave you. Ever. The 400 X 400 pixel screen of the golf watch is protected by a sheet of sapphire crystal. Should you wear the golf watch in public? You should! The golf watch comes with a handsome looking white strap. The strap is made from synthetic leather. The black and white color scheme of the watch will go quite well with a lot of your cloths. Though, if you prefer all black, they also include a black rubber strap in the box. 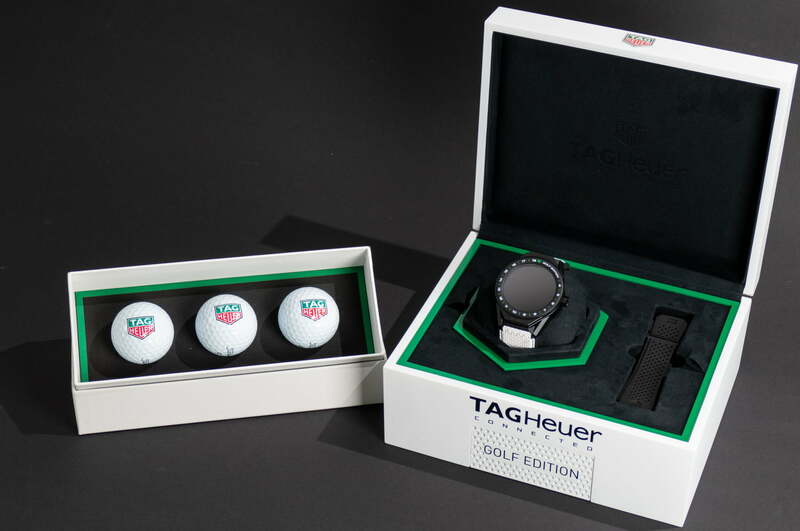 The box also comes with three Tag Heuer branded golf balls. White goes well with green. 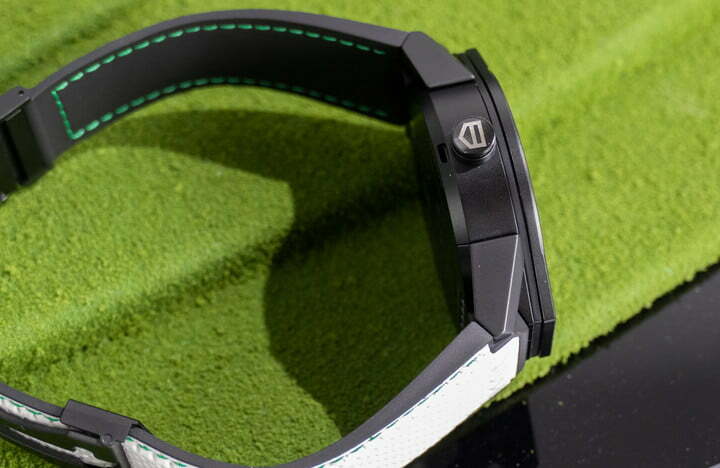 How good is the golf watch at being a smartwatch? It is quite competent since it’s based off of the Connected Modular 45. At it’s heart is an Intel Atom processor. 512 MB of RAM and 4 GB of storage space, GPS and NFC aid the processor in it’s chores. A 410 mAh battery powers all the shenanigans and Google’s Wear OS gives this thing the intelligence to perform its tasks. How much for the golf watch? At $1,850 it costs as much as a decent gaming laptop. Now, I don’t know about you but I would rather play VR Golf Simulator 2019 on a shiny gaming laptop. At least that way I can use it for other useful stuff after I am done playing golf. Abstinence from enjoyment is the only source of capital.